Palomar Hotel In Temecula, CA Is Expanding!! At the Palomar Inn Hotel, we offer great packages to make your stay more enjoyable and affordable. We have great rooms, including two with their own private bath and kitchen. Click to view our rates. The Palomar Inn Hotel is a 10- room historical landmark hotel built in the 1920's. Two rooms have private baths and full kitchens. In the Hotel is the Temecula House of Wine exclusively offering local wines. The unique setting combines the ambiance of "Old Town Temecula" and that of a small family run inn. The Palomar is located in the heart of what is considered the cultural and historic center of Temecula. It is within walking distance of antique dealers, specialty shops, art galleries, and restaurants, also to a new museum, children's museum and performing arts theaters. 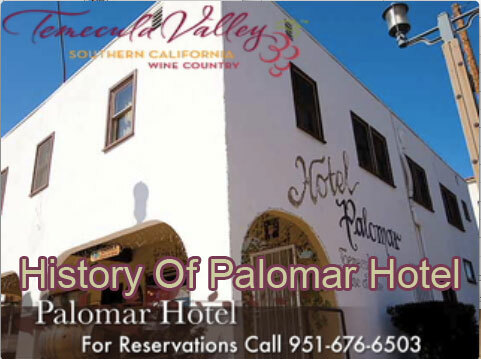 A stay at the Palomar Inn Hotel is a memorable step back in time. Temecula Valley's natural beauty, mild climate, rich history, and convenient location make it a destination worth exploring. The valley truly has something for everyone; wineries, golf, shopping, restaurants, fishing, boating, hiking and horseback riding. A wealth of attractions promotes Temecula as a premier tourist destination for visitors of all ages. Picturesque Temecula Valley Wine Country - 3,000 acres of rolling vineyards and 13 award winning wineries offer interesting spots for wine tasting, tours, and picnicking. Historic Old Town - Newly redeveloped with a western theme that features hundreds of antique dealer, specialty shops, art galleries, and restaurants. In addition to a new museum and performing arts theater. Golf - Golfers select from over seven championship golf courses. Pechanga Entertainment Center - Las Vegas style gaming and shows. Shopping - The Promenade an enclosed major mall and Lake Elsinor Factory Outlet offer's extensive shopping venues. Lake Skinner - Boating, fishing, camping, picnicking, hiking, and horseback riding are offered. Santa Rosa Plateau - The 8.200 acre nature preserve offers an extensive system of hiking trails, equestrian trails, and wildlife viewing. Palomar Inn Hotel room rates start at $65.00 on Sunday through Thursday for rooms with shared baths, and on Friday and Saturday the rate is $99.00. The two rooms with Kitchens and private baths are $75.00 on weekdays and $115.00 on weekends. Weekly rates start at $300.00 and $375.00, respectively. Take a look at our rooms and call us at (951) 676-6503 to check for availability. Tax is not included. If you're new to the Temecula area, or have been here a while and aren't sure what to explore, check out the Temecula Valley Convention & Visitors Bureau!